I am so sad to not be able to run this next year. It was one of my favorite races this year! ANAHEIM, Ca. (June 12, 2012) — Starting today, runners interested in earning their ‘fairy wings’’ can sign up for the Tinker Bell Half Marathon at Disneyland Resort in January. Registration is open at www.runDisney.com for runners interested in the weekend of events aimed at health, fitness and active lifestyles for women and girls. The second annual runDisney race weekend, scheduled for Jan. 18-20, will again be anchored by the 13.1-mile half marathon through Disneyland Park, Disney California Adventure Park – including the new Cars Land – and the streets of Anaheim. The half marathon course will include music, entertainment and Disney characters at various junctures as well as runners in colorful Tinker Bell costumes. Runners who finish the half marathon will receive a Tinker Bell medal with its own set of wings. The race weekend, hosted by Disneyland Resort and the City of Anaheim, features a variety of events, including The Never Land Family Fun 5K and the runDisney Kids’ races on Saturday (Jan. 19), and the Tinker Bell Half Marathon on Sunday (Jan. 20). There will also be a health and fitness expo Friday and Saturday (Jan. 18-19) showcasing the latest running merchandise, as well as guest speakers – all geared toward women. The Tinker Bell Half Marathon Weekend is one of two women-focused event weekends in the runDisney series along with Disney’s Princess Half Marathon Weekend, which takes place every spring at Walt Disney World Resort. Both event weekends are among the largest women-specific events in the country. runDisney is a series of events providing runners unique opportunities to run through Disney theme parks. Race participants earn Disney-themed medals, experience legendary Disney entertainment and guest service and ultimately celebrate their accomplishments with a Disney vacation. The original event in the series, the Walt Disney World Marathon Weekend presented by Cigna, celebrates its 20th year in 2013 and takes place in January followed by the Disney Princess Half Marathon Weekend in February, The Twilight Zone Tower of Terror 10-Miler in September and the Disney Wine & Dine Half Marathon Weekend in November. Disneyland hosts the Tinker Bell Half Marathon Weekend in January and the Disneyland Half Marathon in September during Labor Day Weekend. More than 100,000 running enthusiasts participate in runDisney events each year. For more information, visit runDisney.com and follow us on Facebook (runDisney) and Twitter @DisneySports. Yesterday, an email went out. An email with a promo for Disney Visa cardholders. We could sign up for 2013 Disney Marathon Weekend with a discount ($15 off the half and full, $30 off Goofy). And now I am terrified. It was funny, actually. As I was filling out the form, my heart was racing. What in the world am I doing? Can I actually do this? After all the testing I underwent with my weird heart and having to slow down my running permanently, I said that I would never do a marathon, that I was destined to be a half marathoner. But then I talked to some friends. Friends who said “We want to get the 20th Anniversary Medal.” Friends who plan to run nice and slow, with a 1:1 run/walk pattern. Friends who just want to finish under 7 hours and who believe that if one person has to give up on the run and just walk, then everyone walks. And I thought “I can do this.” If my heart rate gets too high, I can just walk. These friends understand what I go through and that I have to make sure that my heart rate stays in check. They don’t make fun of me for my slow speed. And they will be there with me every step of the way. So maybe I can do this. I have to admit, no matter how this goes, I don’t see myself signing up for any marathons other than Disney. But I’m very excited at the thought of finishing my first marathon hand in hand with wonderful friends. This race always scares me. In 2010, it was supposed to be my first half. The night before the race, I caught a stomach bug that had me out of commission for well over a week. Needless to say, I did not run the race that year. I came back and ran the race in 2011, but I remain paramoid that something will go wrong. It didn’t help that my amazing running partner (who wasn’t running this race, since she went Goofy last month) caught a stomach bug that hit just a few hours after we ran together on Monday. (I am sure she loves that I am blogging about it.) So I was exceptionally paranoid. But I made it onto the plane with no trouble, and that was my biggest fear. Ultimately, I never got sick, thank goodness. The race expo felt very crowded this year, though packet pickup was a breeze. Didn’t do much other shopping due to the crowds. I had preordered the necklace, sight unseen. 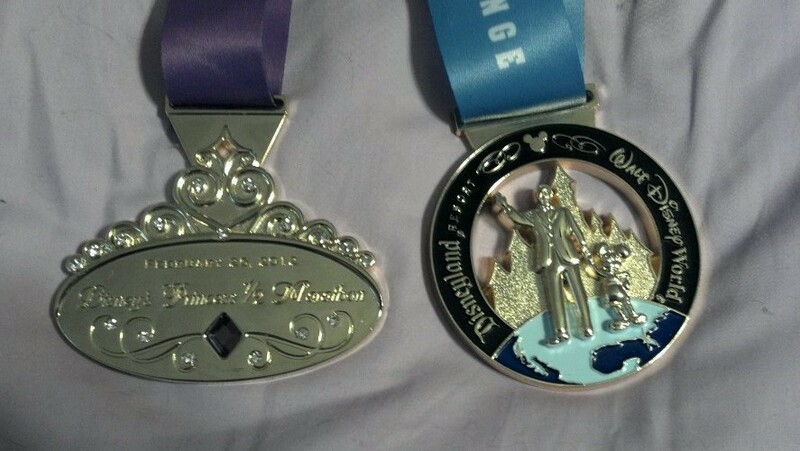 Above are the necklaces from both this race and from Tink. About what I expected for $20. I will probably take the charms off and make a running charm bracelet at some point. There were some people unhappy with the quality, but I have no complaints. The week was a bit rainy on and off, and I was wondering what race morning would bring. The forecast indicated that there might be rain in the later part of the day, and it would be cool, with a high only in the 60’s. Perfect running weather! I wore my Peacock SparkleSkirt with a blue shirt and pink sleeves, which I planned to take off later in the race (spoiler alert: I didn’t take them off). Got to the race start with my sister Caitlin and met up with the rest of the ROTE gang getting ready for the race. The plan was to start out running easy 1:1s with Katie and Caitlin. We all have a race next weekend, so the point of this race was to go slow and steady and have fun. And have fun, we did. The miles absolutely flew by. While I’m not fast with a 1:1 run/walk pattern, it’s very comfortable, and seems doable for a marathon, if that remains in my future. I learned something new about the Princess race as well! The mile markers all have big scenes of the princesses – and they also have Hidden Mickeys! I had no idea! So all you Princesses running next year – watch out for the Hidden Mickeys! One of the great parts about knowing so many Disney runners is that we continually came across our friends as we ran. It made the miles pass so quickly! Races are always a bit of a blur for me, so my recaps usually leave something to be desired. But I always remember the bad parts, and here, there were none. Sure, there was some crowding. Disney races can be slow, and if you’re not in an early corral, the chances of having a very fast race are slim. But you will have fun. I promise. I can’t wait to go back. We cruised into the finish very comfortably, after seeing my parents right near the end, which was awesome. We got rained on for approximately 30 seconds, also awesome. And I finished and got my medal and then got my Coast to Coast medal! It was a lot of fun wearing the C2C medal around the parks and getting all sorts of questions about it and about Tink. After the race, the rains really started, so we rushed back to the hotel for breakfast and showers. Then it was off to the park for some fun! As always, I loved this race. runDisney puts on great races, and I’m so glad to have been part of this one. One more runDisney race for me this year – the inaugural Tower of Terror Ten Miler! Can’t wait! Thanks to runDisney, I had the opportunity to attend a Meetup with Jeff Galloway (and other fabulous guests) the day before the Tinker Bell Half Marathon. The morning started early – we met near the Disneyland hotel at 6:15 (not bad for someone still on East Coast time). We were all given runDisney shirts to wear and set off on a 2 mile run through Disneyland. Running in Disneyland and California Adventure at that hour was amazing. I ran with my friend Carrie from ROTE and my new blogger friend Mallory. Mallory took some amazing photos – I don’t know how she was able to tweet and run as well as she did! We were told to be ready to run at a 12:00 pace. I’m more of a 12:50 kind of girl, but I thought I could handle it for 2 miles. We were running a 40 second run/20 second walk pattern, and well, I just couldn’t keep up. We weren’t too far behind, but my heartrate kept skyrocketing, so I had to slow up a bit. Mallory and Carrie stuck with me though, and we had a lot of fun. We finished the run and I was shocked to see that we actually stuck to around an 11:30 pace! We then headed into the Art of Animation theater for a few presentations. It was fantastic. We listened to runDisney’s Bob Hitchcock talk about runDisney and social media. Bob’s a great guy and he definitely organized an amazing event. Then he introduced Robin Trowbridge, who discussed all of the entertainment and special touches that go into a Disney race, such as having Tinker Bell fly during the 5K and having characters out on the course. Someone asked what happens when Snow White needs a break – does another Snow White come out? We were all appalled. Of course there is only one Snow White! We also heard from Lori, the runDisney member of the Disney Mom’s Panel. What a sweetheart. Megyn Price was the “celebrity runner” for this race, and trained up for this as her first half. She got to wear Bib #1! She was awesome to listen to. She was so normal and down to earth and, like every new runner, was terrified that she wouldn’t finish her first race. (Spoiler alert – she did!) She talked about how she had never been an athlete and how she wanted to do this to show her daughter how strong women can be. It was fun when the tables sort of turned and instead of asking questions, people started reassuring her that she would be just fine. And of course, the man himself, Jeff Galloway. This was a great Q&A session – plenty of time to ask questions, anything from how to figure out run/walk intervals to the best way to start. And he has a great rule – one that I follow myself: No puking. I know many people who throw up after a hard run. No run is worth that to me. Jeff had great tips about listening to your body and doing what’s right for you. At the end of the event, Minnie came out in her cute running outfit and posed for pictures! Then we were treated to a wonderful surprise – we were invited to tour the Disneyland Dream Suite! The Dream Suite is in New Orleans Square, by Pirates of the Caribbean. It’s in a space that was originally intended for the Disney family, but it wasn’t built until 2007. The space is amazing and is based off of the original plans for the apartment. There were many sweet touches to the space. We weren’t allowed to take photos, but I found a great online walk-through here. What an amazing event. And this was only a small part of the weekend, as the next day was the main event – the Inaugural Tinker Bell Half Marathon!